For the 7th release on his label,Temi Kogbe compiles Willy Nfor's greatest songs from his solo works. The session player (bass) was involved heavily in the African boogie / funk scene with a impressive credits list. (with Fela Kuti's Egypt 80 alumni), joined Mory Kante band toured the world on the back of the Global Hit record, unfortunately, he died before the world could really know him. 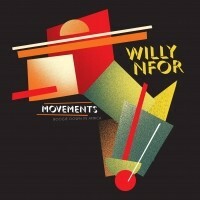 This compilation (from three rare Nigeria-produced LPs; Mighty Flames' Willie Nfor, Feel So Fine, My Turn) capture Willy's vision of a free world where love, music and breaks migrate freely. His afro-boogie nods to Bootsy Collins and Louis Johnson (The Brothers Johnson) but it invariably afro and inalienably Willy's music, a space funk with deeply rooted rhythmic grooves that has made these LPs highly sought-after by music aficionados and selectors worldwide.